by ceciliemo ~ February 18th, 2014. Filed under: Food, Latest News, Norway, Oslo. We visited Sweet Rendez-vous kafé at the Majorstua library. Lilla (left) and her two friends from Hungary had set up a lovely pop-up restaurant for the book readers. Here they sold home-made marzipan, cookies, pistachio muffins and savory muffins. And coffee, of course. I love the idea of the international Restaurant Day, you can read more about it here: Restaurantday.org. Maybe something to try in your city? Vi besøkte Sweet Rendez-vous kafé på Deichman på Majorstua. Lilla og hennes to venninner fra Ungarn hadde laget en flott pop-up restaurant i biblioteket. De solgte hjemmelaget marsipan, cookies, pistasjmuffins og muffins med soltørket tomat og oliven. Og kaffe, selvsagt. 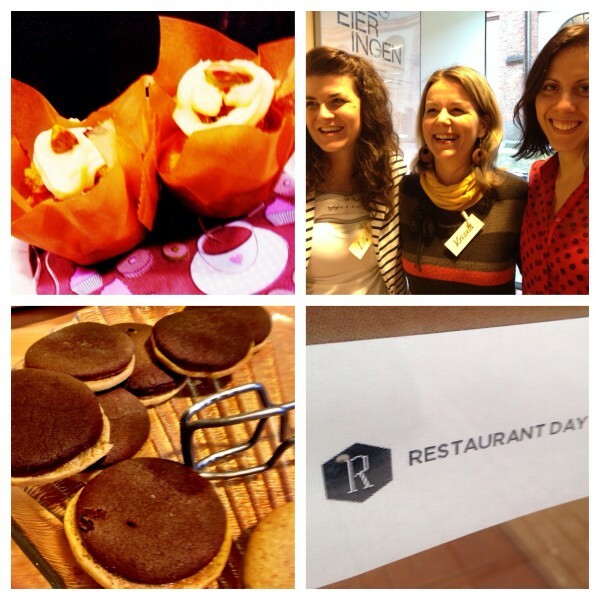 Jeg digger ideen om en internasjonal Restaurant Day, du kan lese mer om konseptet her: Restaurantday.org. Kanskje du deltar i din by neste gang?